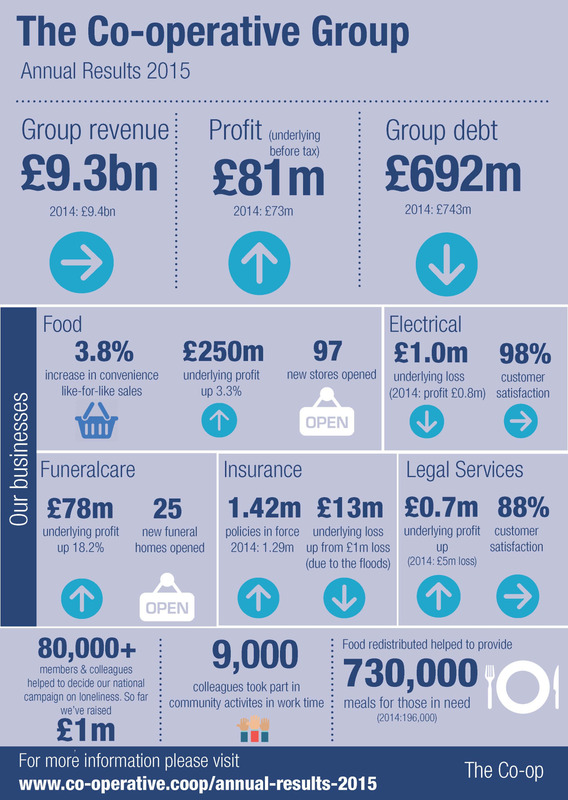 Nick Crofts, The Co-operative Member Council President shares his thoughts on our Annual Results announced in March 2016. “With some key decisions taken in the last few days, 2016 is shaping up to be a very significant year in our Co-op history. I’ll tell you more in a moment. But first let me bring you up to speed on some recent news. Last week we announced our annual results for 2015 and we highlighted the enormous investment we’re making for the future. We’ve put £400m into the first year of our Rebuild strategy, reducing prices for our members and customers and improving our stores, branches and our customer service. Of course there’s still lots more work to do to meet our ambitions and we have a further investment of £900 million planned during this year and next. We’re making our Co-op Insurance offer better, especially for members, and we’re going to keep growing our food stores and funeral branches and our legal services. Meanwhile, in the background, we‘ve been looking at what Co-op membership should mean for individuals and how it should relate to the communities in which they live. The Council has been shaping these ideas and ensuring that, whatever changes we make, our Co-op values will remain at the heart of all we do. At our Council meeting last Saturday (9 April) we went through the plans once again with member of the Group Board and the Group Executive and satisfied ourselves that our approach is right and will give our millions of members a compelling reason to shop with us even more. The progress we’ve made already means we can be confident about announcing the next stage of our recovery. So our attention is now turning to our AGM on Saturday 21 May. It’s going to be a big moment for all of us. And the centre-piece will be some very exciting news about the future of Co-op membership. I’m not going to give anything away just yet, that would spoil the surprise, but our plans will put Co-op membership firmly back at the heart of the business in a way that benefits both individual members and their local communities. Longer term, it will also strengthen your Co-op voice giving you an even bigger say in how we do things. Later this month eligible members will be receiving your AGM voting packs either in the post or by email. Using your Co-op Vote is another example of what makes us different and special. You can vote for representatives to your national Council and for Member Nominated Directors to our Board. Plus, motions about the things we’ll do in the future. This year we’ve added an additional incentive to voting. The business will donate 50p for every vote cast to support our fundraising work to tackle loneliness. And if everybody that can vote does vote that will add £1 million to our work with the British Red Cross. Great to hear of commercial progress BUT we as members have only had one meeting since Area Committees were abolished.